Next Layer: 4&3/4" by 3&1/2" piece of kraft canvas patterned paper--glue to first layer using Scrap Happy Glue. Stamp sentiment and berries on white cardstock with Black Tuxedo Memento ink. Color berries with markers. 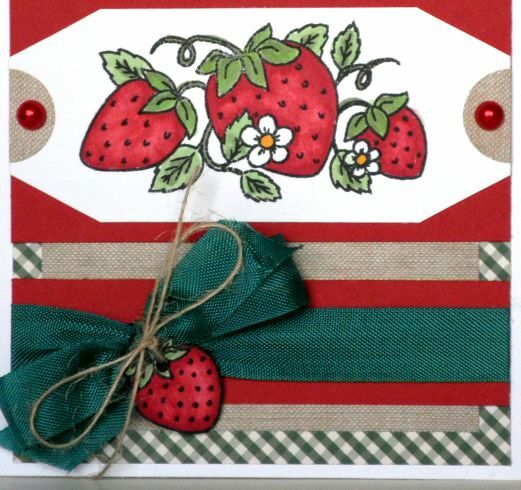 Trim sentiment to 4" by 5/8", mat on red cardstock glue to top of card (about 1/2" from the green gingham border). Trim berries piece to 4" by 1&3/4" and trim off corners. I did this on a scrap piece of cardstock to get the look I wanted, then used it as a template to trim all the corners so they'd be even. Mat this piece on a 4" by 2" piece of red cardstock. 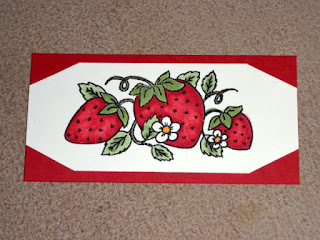 Punch a 3/4" circle from the kraft canvas patterned paper, glue to the sides of the berry piece. Cut a 4" by 1" strip of red cardstock, tie a bow around it with green seam binding ribbon. Stamp single strawberry in Black Tuxedo Memento ink, color with markers, and tie to green seam binding bow with jute string. 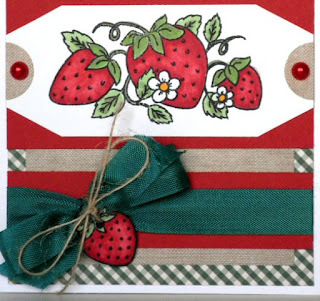 Use Scrap Happy Glue to adhere this piece to bottom of card front (about 1/2" from the green gingham border). 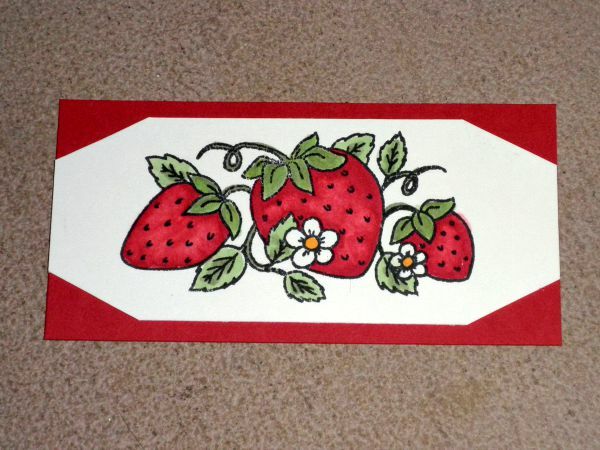 Glue berry piece in the middle of the card. TIP: it's easier to center this now that the other two strips are in place! 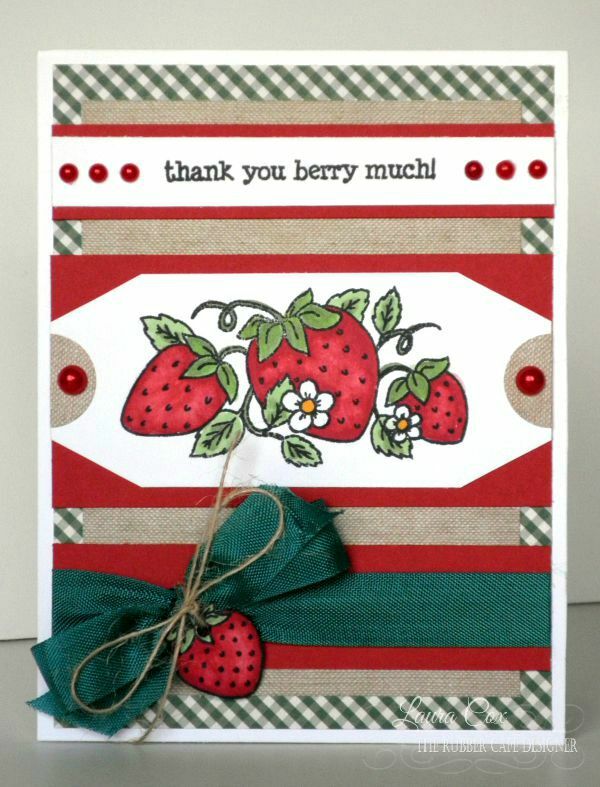 Add red pearls to finish card. Thanks for stoppin' by the cafe' today! We'll have so much more inspiration for you.....stop back soon!